Number of Allowed Builds in Parallel The number of build queues that will be utilized to build projects. This allows concurrent checkouts and builds of multiple projects. Available since version 1.3.1. 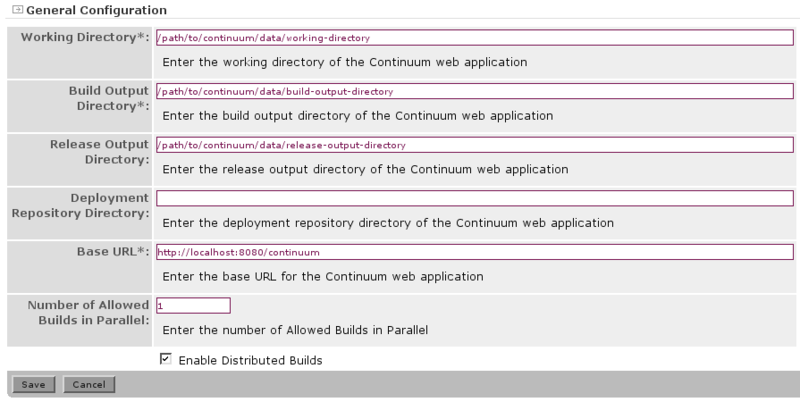 Enable Distributed Builds When checked, this Continuum instance will delegate all builds to configured agents. Shared Secret Password The pre-shared key (PSK) between the master and all configured agents. The PSK will need to be copied to all configured agents. You can modify values or keep defaults then save. Although Continuum defaults to storing its data within the installation, it is a best practice to separate the installation and data directories. These values can be pre-configured in continuum.xml. Make sure that Continuum is not running when editing this file.